I have been doing this for so long that I find myself somewhat at a loss for words. For the last six months or so, I have been very focused on finally finishing Digger’s unexpectedly epic journey (some of you undoubtedly remember those first five pages, and my constant refrain that I was just doodling and not to get attached!) but I didn’t actually spend much time thinking about what to say once I did. I guess the only thing to say is “Thank you!” So many readers have given me so much encouragement and support and time over the years that I won’t even try to name them all. I’d say it has been a labor of love, but that’s both a cliche and doesn’t really cover the obsession and stubbornness and the desire to prove that I really COULD finish a giant project, damnit, and the vague fear that if I just stopped in mid-comic, I would be hunted by an angry mob, which all factors. Also, love. 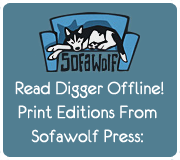 The final print volume of Digger should be available from Sofawolf Press later this year. I’ll put up a post here, and of course the comic will remain up as long as the hosts are willing to host it. Possibly I’ll have something clever to say in a few days, in which case I’ll put up a post or something, but right now, about all I got is…dude. 759 pages. How ’bout that? Thank you, Ursula, for such a wonderful journey. I have enjoyed every minute of it, even the parts that left me sad. I’ll miss coming here every day to get a new page, but I’ll have my memories and soon, I’ll have the books. Oh, wow. I’ve followed since the beginning but I haven’t said a lot. This really was a wonderful story (I even used the scene with Shadowchild and Sweet Grass Voice for a project about good vs. evil! ), and I’m going to miss it. I look forward to see what else you’ve got cooking up! For those of us in denial or wanting another fix, I’ve created a Digger fan fiction page with links to all the stories I know about so far. I shall order the available books and hope for a future ‘Compleat annotated Digger’. But for now I sadly remove Digger from my bookmarks. If I wish to return to the tale online I know where to find it. Thank you for the journey. It’s funny. I knew this wouldn’t have updated, but I couldn’t help but check it. Not sure if I said this, but…. I am going to miss seeing Digger updates every T and Th from now on. Thanks for a wonderful journey. Thank you very much for this story Ursula! Wow. This ending feels so abrupt, I didn’t expect that at all. Thanks Ursula for the wonderful tale that you took so much time to put into. I have to hope that sometime in the future when you don’t feel so spent that we might have some extra Digger adventures, but realize that is up to you. Kudos for finishing such an epic tale and keeping the quality constant throughout. Our lives have been made a little better for having shared the world of your imagination. I’ll miss you, Digger. Ursula, I’m eager to see what you have up your sleeve for your next project. Thanks for sharing your amazing story. It was a sweet ride from cover to cover. Thank you. I thought I’d have something more intelligent to say when this came, but I don’t. Here’s to Digger-of-Unneccesarily-Convoluted-Tunnels, the most down-to-Earth (and under) heroine ever. May her claws stay sharp, and her tunnels [unintelligible muttering]. May she live to tell her grandchildren of her exploits. Wow. I knew it was ending soon, but coming back from a ski-trip to find that was a bit of a shock. A little miffed I Never got to see Digger confront Grim-Eyes about how she really fells about Ed, but then again, the fact is it didn’t NOT happen. This ending is pretty open-ended. It leaves a lot to the reader imagination, and I guess that’s the best way of doing it really. I know how Diggers good-buy play out in my mind, and perhaps its best it stays that way, for me and all the other fans. Plus the artwork is, as always, amazing. Well, there we go. I won’t say so long to our friend Digger-of-Unnecessarily-convoluted-tunnels as I’ll be trawling the archives for a LONG time yet, but i will say a big thank you to all the other commenters, especially Duckwhisperer, Rowan, Rags, Song Coyote, Lord the 22nd, Mark Antony, JewelWolf, WussMajor, KNO3, MadamAtom and, of course, Tekserver. You guys made it a very fun comic to comment on as well s read, and thank you for putting up with a geeky, weird little Englishman ravening’s. There’s more on my website if you ever need me. And a very big thank you Ursula. You may have caused nearly as much psychological damage to be as Steven Moffat, William Horwood, Dave Hopkins, Neil Gaiman or Richard Adams, but only because you are every bit as good a story-teller as they are. Every time I wake at three AM convinced there is a Cold-servant living in my cupboard, I’ll just smile, think of your wonderful webcomic, and hide under the covers and imaging Boneclaw and Grim-Eyes beating it up. So Ursula…So long, and thanks for all the Hyenas. Wait, so theres not gonna be a next book? Yep, I just checked again too, werebear. Like BunnyRock, I want to say thanks for sharing your thoughts, commenters-who-now-seem-like-old-friends, but most of all, thanks for sharing Digger’s adventure with us, Ursula. *waves at BunnyRock* Hey, thanks, and same to you! We can still vote, y’know. Digger’s fallen out of the top 100 as of the month change, and that’s a shame. Slywulf’s comment about a missing tooth rings a bell with me–I haven’t been checking back in hopes of seeing something, but I still feel the lack every T-day. And now I have only Girl Genius and Kaspall to vote for each day. Me too, werebear et al. And I also miss one of the most intelligent communities of commentors it’s been my privilege to read (and occasionally join). It was a joy and a pleasure. Sometimes, we read something and wish that we could have those minutes back – I’d gladly pay thrice my time for the experience you’ve given us. Be well, now and always. I just finished re-reading this for the hundredth time. Each time I discover some subtlety that I’d missed or failed to understand the last time. I can’t help but think that I really want to see a Digger movie, but at the same time I can’t help but think that that would be an ungodly horror, to see what the movie industry would do to this story. Maybe a fan-made, low-budget, shot by your little brother on a Flip video camera version would be best. Well then, I reckon I’ll start over. I keep coming here like so many others looking for that crazy non-existent update. Digger was a great story and still sad that it ended. Hey, I’ve loved the comic for years, and I’m kinda sad that it’s over; but the real reason I’m commenting is that I saw some of your books in my local bookstore yesterday, which I think is just awesome. So much to say, I don’t know where to start. First and foremost, yet another thank you to Ursula, without whom we wouldn’t be here. Like many others here, I was a bit surprised by the abrupt ending, and not entirely pleased at first. What about Shadowlescent? What about the ramifications of the story’s events, the cultural effects on not just the hyenas, but also the Veiled? And then I gradually realized, again as others here have, that those details are are not really needed to end this story. They are not irrelevant, nor are they unimportant. But they also don’t need to be drawn; we can all see them already in our minds. I, for one, will not miss Digger. Digger, and her world, will forever be a part of me. Every time I see a couple of tomatoes, and imagine them growing tiny antlers and battling with each other; every time I look askance at the squash that came out of the garden, wondering how close it came to becoming vampiric; every time I ponder the personal lives of trolls (be they biological or professional); and of course, every time I see a wombat – any of these and a gazillion other things will remind me of Digger and the rich tapestry of a story of which she and we were privileged to be a part. The final facepalm count is 119: 100 by Digger and 19 by other characters. The final facepalm was performed by Trader Manuel two pages back, instigated by the Bandersnatch (and its/their union). Thanks to all the amazing, insightful comment creators, and special thanks to my geeky, weird little English friend, BunnyRock. Finally caught up and finished Digger, it brought a smile to my face and a lump to my throat. A beautiful, funny, moving, inventive and engrossing epic you’ve created Ursula. Be very very proud. @TekServer Tah. That means a lot to me. by the way, my weird, geeky, English little website is behaving itself a lot more now (still looks terrible, and until I lean to write code the comments sections are broken, but one step at a time). If you, or anyone else for that matter, feel sufficiently incautious as to want to see what it’s like in my mind, short stories will be going up there just as quickly as I can write them (one just up today), which given that my muse is easily distracted by Shiny Objects , string, Fanfic, butterflies, TF2 and cups of tea, it rather less often that I would like. I also apologise for just how weird some of the stuff I right is. All I can say is I’m not TRYING to cause anyone permanent mental damage. El-ahrairant is a harsh, if attention-deficit, mistress at times. Working on improving, if that makes sense. It goes without saying the site will soon have MORE digger fanfic than before. My offer still stands to put other people up if they arrange to E-mail it to me. P.S. didn’t there used to be Digger forums somewhere? Maybe in the Graphic Smash forums? I was talking to Crocuta Sapiens the other day, and I said I’d seen some but now I can’t find any. Thanks. For a great and gripping story, and (well) for fantastic artwork. Congratulations and thanks to our Host and Artist for a truly excellent web-graphic-novel. In my opinion, it’s risen above the level of a simple webcomic, from the earliest stages. I must admit, I’m slightly torn now: I want to follow the oh-so-tempting links to buy hard copies, but I don’t want to lose the comments available on the website. Perhaps at a later date, once the commenters have said all that needs to be said (and I have shelf space! ), I’ll treat myself. The final few pages seem a bit abrupt, but then this is really all that needs to be said about the Quest of the Chained One. Anything else is no longer part of this story, but deserves to stand on its own. That isn’t to say that I wouldn’t be glad to follow the adventures of Digger on her year-long journey home, and to find out whether her hallucinations about home’s destruction were due to anything more than bad air, but that is a different tale without many of the characters who have defined this one. Grim Eyes, Murai, and the Shadow are also gone on their own separate paths; their stories are now their own, and not those of this cast. The comments have provided a most interesting counterpoint to the graphic novel itself. I never expected, on starting to read about a Wombat engineer, to learn so much about so many other areas of tangential interest. My only regret is that I came to this so late, and therefore missed seeing things unfold week by week with you. Once again, my sincere thanks. May you receive only as much attention from the Gods as you would wish, and may your works always run to plan. Wait, so there’s not going to be any more digger journies? Aw I’m sad that it’s come to an end but loved the trip. After all in the end it was the journey that was important. @Jessica: Ursula is alive and well, which means that Digger’s world is also very much alive and well. I’m not hinting at some secret knowledge, just saying that I wouldn’t be surprised to see more of this world later (after Ursula has recovered somewhat from this epic journey). In the mean time, why not subscribe to the comment RSS feed, and interact with the occasional late-comer as they make their way through the archives? Happy birthday to you, Ursula! Happy belated, Ursula! 😀 I wish I had a present for you, but it seems that in terms of gifts our relationship will always be one-way, with me at the receiving end… And what gifts! Reading and re-reading Digger has always been a wonderful experience and I intend to keep at it until the end of time, the internet apocalypse, the ultimate failing of my memory, or the rise of true VR (at which point I will rather experience Digger’s world firsthand), whichever comes first. And although Digger’s tale is (at least momentarily) over, RedWombatStudio keeps updating (nice stuffed goat, btw), and I know that whenever I feel mad or rich enough Nurk is still out there, waiting for me… In short, Ursula Vernon is a gift that just keeps on giving. And I am very happy and grateful to be one of the many recipients. So thank you (again – I know this is becoming repetitive), Ursula, for being awesome and imaginative, and most of all for sharing your incredible mind with us. You make my world a better place. … So, this has been some journey. I remember finding a startled wombat, a large statue of Ganesh, and a speech-bubble mirroring the “whoa” in my mind all that time ago on Elfwood, back when the woods were the place I frolicked about with my fangirlism and horrible English grammar (I improved). I remember reading the comic on my laptop, which still functioned (more or less) back then, in bed (take that, print-enthusiasts! ), while the night dragged on and on without me even noticing, which was really weird for me back then (I’ve learned to defy sleep by now, of course). I remember getting to the end of the free line and immediately laying plans to get daddy to spend electronic money on electronic comics, although none of the plans ever functioned. I remember the extreme happiness when the comic changed site and I could read on, and the tedious joy of eventually catching up with the plot and reading it update by update. And now here I am, after my first proper readthrough of Digger with no waiting for updates, no need for payment, and with all the commentary of the fabolous fanbase to hold my hand on the way… “Scrawled little arrows in different coloured chalk… and maybe the occasional suggestive limerick, as well.” It’s a fantastic feeling, standing here, at the end of the line, looking back at that incredible vista… and knowing that it’s not even over. I can still go back and start over, and who knows? Maybe I’ll discover some old leaves I didn’t talk to last time round, or I’ll find some new scrawlings on the walls of the metaphorical cave. And as everyone keeps saying, there is something special about the scrabbles of these particular cave-walkers. Actually, let’s make that “there’s something special about these particular cave-walkers”. I mean, just look at BunnyRock. What are the odds that a rock should look (nothing) like a bunny? What are the odds that said rock should know more than can possibly be healthy about an array of strange topics including but not limited to archeology? And TekServer! How can a man go through all of this, the commentary in particular, and not read Terry Pratchett? Unless he has now, of course, but you have to agree that he’s pretty unique nonetheless. There’s DuckWhisperer, WuseMajor, MadamAtom, JewelWolf, Lord the 22nd and his ever-changing avatar… There are memos about being shot by crossbows, discussions about the movement of the statue of Ganesh if he was a snail, there’s the story of Climber the lizard, if only in bits and pieces… There is almost too much awesome for one mind to contain. Which makes it even better that I’m allowed to share it with all of you. Or however that works. For the record, Ellemerr, I have indeed started reading Pratchett. I’ve read (well, listened to, actually) “The Colour of Magic”, “Light Fantastic”, and “Equal Rites”, and I’ve recently started on “Mort”, and next up will be “Sourcery”. Awesomesauce! By the smiley I’m guessing you’re enjoying them, too! ^_^ Equal Rites is one of my favourites, right below the Wee Free Men books. Little blue men for the win! I’m still amazed at your ability to not read them for so long, though, considering the crowd. xD They’ve got me watching Zim, addicted to Gunnerig Court, checking out a host of other webcomics, reading fanfiction (something previously believed to be impossible)… and so on. You’re probably not done, either. It’s insane. Oh, sweet insanity, enshroud me in thine fogencumbered wreath. Oh! To forget the world, and all of its dealings! Madness, here I present myself to worship you. Come quickly, sweet Nemesis, I beg of you. But even with all of that, I haven’t really put a dent in the available material in my favorite genres. There are still hundreds of thousands of good books awaiting me, and more being printed every day. I can only read them so fast (I DO NOT speed read for pleasure reading) and still have time for other activities in my life, such as reading and commenting on web comics. Oh, yeah, and work; I still have to do that once in a while. But I always file away recommendations from sources whose opinions I value (most Digger readers fall into that category) into the back of my brain for future additions to the reading queue. Oh, and FWIW, I currently “read” 3 books at a time: one in paperback (or the rare hardback) in bed before falling asleep every night, one audiobook in the truck whenever I’m on the road, and a second audiobook on my phone for walking, waiting rooms, etc. Currently my three are “Murder in LaMut” (Legends of the Riftwar: Book 2) by Raymond E. Feist and Joel Rosenberg (paperback), “Mort” (Discworld #4) by Terry Pratchett (truck), and “Juxtaposition” (Apprentice Adept #3) by Piers Anthony (phone).